First came love ... then came Reverend Frank. Newly engaged, Ben Murphy (John Krasinski) and Sadie Jones (Mandy Moore) can't wait to start their life together and live happily ever after. The problem is that Sadie's family church, St. Augustine's, is run by Reverend Frank (Robin Williams), who won't bless Ben and Sadie's union until they pass his patented, "foolproof" marriage-prep course. Consisting of outrageous classes, outlandish homework assignments and some outright invasion of privacy, Reverend Frank's rigorous curriculum puts Ben and Sadie's relationship to the test. Forget happily ever after - do they even have what it takes to make it to the altar? $10.422 million on 2604 screens. Perhaps I’m a glutton for punishment, but occasionally I come across a movie that looks so thoroughly atrocious I can’t help but give it a look. 2007’s License to Wed fell into that category. In Wed, we meet Sadie Jones (Mandy Moore) and Ben Murphy (John Krasinksi), a young soon-to-be married couple. She wants to follow family tradition and get wed at St. Augustine’s church, a decision that comes with a specific condition. That facility’s Reverend Frank (Robin Williams) requires couples to go through a “marriage preparation course” before they can tie the knot. Circumstances require that the wedding take place in only three weeks, so Sadie and Ben must pack a three-month course into much less time. The film follows their ups and downs as they navigate Frank’s pushy ways and other obstacles on the path to matrimony. 25 years ago, I thought Robin Williams was a hoot. Now I can’t quite figure out why I ever felt that way. If his patented stream of consciousness comedic style used to work, it sure doesn’t now; his shtick lost most of its ability to entertain decades ago, and he seems more like a parody of himself. Actually, I shouldn’t blame Williams for the failure of Wed. Sure, he makes an inherently unlikable character even more loathsome, but the problems that befall Wed result mostly from the script and the director. This isn’t so much a movie as it is a collection of loosely connected comedy skits. The film bounces from one recycled sitcom beat to another without the slightest sense of logic or coherence. Wed clearly cares more about its comedic conceits than it does little nuances like characters, plot or – gasp! – relevance to reality. Wed, yes. The writers wanted a way to introduce Frank and his course, so they took a cheap and idiotic method to do that. It’s also ridiculous that the “plot” forces the couple to either get married in three weeks or wait two years. If that’s not cheap sitcom thinking, I don’t know what is. From there until the movie’s conclusion, the gags prompt the story instead of the opposite. Not a single one of them ever makes the slightest bit of sense. Do we really think Frank would conduct such a risqué Sunday school class about the Ten Commandments? Does it seem logical that right after he preaches those Commandments, he steals? Does… oh, I give up. If I detail every absurd twist in this film, I’ll never finish this review. Perhaps none of this would matter so much if the movie actually entertained. Alas, no amusement will ever result from this effort. The closest thing to a laugh occurs when we learn of a mistaken inscription on Sadie’s wedding ring. Even that moderately funny bit flops because the filmmakers beat it to death. Rather than take the chuckle and move along, they pound the gag into us with umpteen repetitions. I get the feeling the filmmakers feel no confidence in their abilities, so they wear out the jokes because they worry we won’t get them otherwise. This also means that many verbal gags come with slapstick stingers. The spoken bit didn’t work? No worries – here comes some physical comedy to seal the deal! It all seems exceedingly desperate, as the movie almost grovels in the ways it stoops to amuse the audience. All of which leaves Wed as a genuinely atrocious film. It lacks the slightest sense of reality, as it stretches, snaps and stomps on credulity in its pursuit of laughs – laughs that it never obtains. This film provokes disdain, animosity and outright anger at times, but amusement? That never happens. 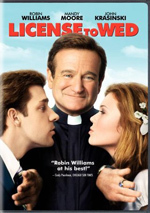 License to Wed appears in both an aspect ratio of approximately 2.35:1 and in a fullscreen version on this single-sided, double-layered DVD; the widescreen image has been enhanced for 16X9 televisions. Only the letterboxed picture was reviewed for this article. A generally attractive picture, Wed didn’t suffer from too many issues. One mild concern stemmed from sharpness. Much of the movie came across as distinct and accurate. However, light softness cropped up at times. Those distractions were mild, though. No problems related to jagged edges or moiré effects occurred, but I noticed mild indications of edge enhancement. Source flaws remained absent. With a natural palette, I thought the hues of Wed looked fine. The movie exhibited some bright colors, and these remained reasonably crisp and concise. Blacks also came across with nice depth, while low-light sequences demonstrated acceptable clarity and openness. The edge enhancement and softness were the main concern here, and those dropped my grade to a “B”. The Dolby Digital 5.1 soundtrack of Wed lacked sonic ambition. I don’t expect this sort of romantic comedy to give me something to show off my system, though, and this track lived up – or down – to expectations. Music showed nice stereo imaging, but there wasn’t much to the rest of the mix. Various effects added a bit of breadth to the settings, and some decent environmental material developed. That was about it, though, as the mix failed to open things up to a significant degree. The surrounds remained quite passive through the film. Although the scope of the track appeared bland, the quality of the audio was fine. Speech came across as concise and well defined. I discerned no concerns related to edginess or intelligibility. Music showed good range and dynamics, as the score was bright and distinct throughout the movie. Despite their small role in the presentation, effects also seemed clean and accurate. The mix featured acceptable bass response and clarity overall. It simply failed to ever present an engaging soundfield, so it earned only a lackluster “B-“. Expect minimal extras here. We get a collection of five Additional Scenes. This set runs a total of 12 minutes, 27 seconds. These include a genuinely terrible alternate opening - complete with Terry Gilliam-style animation – plus a game of one-on-one between Frank and Ben that acts as an alternate for the “catch” scene. We also see how much Carlisle outranks Ben, Ben’s bachelor party and Sadie’s shindig, and a finale with Frank and the Choir Boy. These are just as bad as the clips in the final cut – maybe even worse. They’re completely terrible. We can view these scenes with or without commentary from director Ken Kwapis. He gives us notes about the sequences and usually lets us know why he cut them, though a couple of clips don’t include that explanation. Kwapis proves pretty informative, though, enough so to make me think a full commentary for the film would’ve been interesting. Ask Choir Boy allows you to “choose which relationship/marital questions he answers”. This lets us view 12 different video clips in which “Choir Boy” replies to phone calls on an advice radio show. It’s just as lame as the “comedy” in the movie itself. A few ads open the DVD. We get promos for Ocean’s 13, In the Land of Women, PS I Love You, The Ellen Degeneres Show, and Seinfeld Season 9. No trailer for Wed appears here. 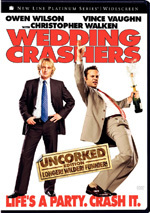 Since I went into License to Wed with rock-bottom expectations, the possibility existed I might not loathe it so much. After all, when you anticipate a film completely bereft of entertainment, it can’t help but surpass those expectations, right? Wrong – at least in this case. Wed does many, many things wrong and almost nothing right. The DVD offers adequate picture and audio along with a minor set of extras. Unless you’re curious to see the depths to which Robin Williams can fall, avoid this atrocious film.